This entry was posted in Portfolio and tagged MGX.DE on May 26, 2014 by Alpha Vulture. I’m obviously not very thrilled about this latest development because if I decide to hold the stock it will be totally illiquid: there is no German equivalent of the pink sheets, so it would be (nearly?) impossible to trade. I think small investors should embrace illiquidity, but no liquidity is probably a bridge too far. A delisting also creates more corporate governance risk and is probably going to result is less disclosure to minority shareholders. I’m not very familiar with the laws and regulations in Germany, so if I have a reader that is more knowledgeable w.r.t. to the position of minority shareholders in delisted companies and other related issues I would love to hear from you! This entry was posted in Portfolio and tagged MGX.DE on May 20, 2014 by Alpha Vulture. Magix AG released their results for the fiscal year of 2013 on 28 February, and apparently the market required some time to digest this information (shares are up 13.5% today). I also failed to notice the new information until today, but luckily it was good news. Revenues increased by 12.8% from €28.8 million to €32.5 million while EBIT before other operating income went from minus €1,156,000 to positive €2,706,000 (this measure is more meaningful than unadjusted EBIT because the company had a large one-time gain in 2012). Impressive is that this jump in growth was almost completely achieved in the second half of FY 2013, and most of the growth can be attributed to the German part of the world. Also nice to see is that the mufin technology is finding it’s way to the market. I doubt that it’s generating a meaningful amount of revenues at this point in time, but with 27 thousand reviews on iTunes there are at least a decent number of people using the TV Smiles app. With the company expecting future growth in FY 2014 I think it’s still a pretty good deal at current prices. The company has now a €34.1 million market cap (8,844,979 SO * €3.86/s) and €16.6 million of cash in the bank (after adjusting for the share repurchases completed after the end of the current period). That means that we are effectively paying €17.5 million for €1.9 million in earnings power (€2.7 million ‘core’ EBIT with a 30% tax rate) implying a 9.2x PE multiple. That’s not cheap if you don’t expect growth, but given how profitability increased this year with ‘just’ a 12.8% jump in revenues I think it’s clear that there is a lot of operating leverage. Higher revenues should flow almost straight to the bottom line, and a further 10% growth in revenues could more than double earnings if costs stay under control. Also noteworthy is the fact that the company has decided to stop reporting using IFRS and has switched to German accounting standards instead. This makes it harder to compare current results with historical results, but it seems to me that the differences aren’t too big. The biggest change seems to be that goodwill is depreciated under the new standard, reducing book value and historical earnings. This entry was posted in Portfolio and tagged MGX.DE on March 5, 2014 by Alpha Vulture. Magix became public in 2006 through an IPO that was used to raise €20 million. This was – in hindsight – obviously done at an opportunistic time: the share price of the company quickly declined from €14/share to less than €2/share at the end of 2008. Without a doubt investors were thinking that they were buying a solid growing software business while reality turned out to be different. That doesn’t make Magix a bad business. Gross margins are extremely high, as you would expect from a software company, and ROIC is high thanks to the asset light business model. While there are a lot of interesting things to note about the historic performance the most important thing is how much free cash flow the company is generating. While the company has an enterprise value of just €11.5 million they generate roughly €3 million in FCF after spending an equal amount on capital expenditures. This is a bit deceptive though since almost all income last year was the result of the reduction of a royalties provision. Without this one time gain the company would have been roughly break-even. This doesn’t mean that the company doesn’t have any earnings power. they spend more than €13 million/year on R&D: more than the current enterprise value of the whole company. You have to believe that their R&D is a massive waste of money to believe in the current valuation. noch jung und verspricht enorme Wachstumschancen. Als Teil des Venture-Segments wird mufin maßgeblich zum zukünftigen Wachstum der MAGIX-Gruppe beitragen. If this is indeed the case remains to be seen, but either the R&D pays off and future revenue and earnings will increase or they can cut back on the R&D and earnings also go up. The Venture segment (that includes the mufin subsidiary) produced a negative income of €1.3 million for the TTM, and this could easily be cut away if needed. A loss making subsidiary that obscures the profitability of the other subsidiary is a classic recipe for undervaluation. Magix creates multimedia software for the consumer market. I haven’t tried any of their products, but it seems to be relative basic software for tasks such as creating slideshows from vacation photo’s or video’s, digitizing old analog video’s, recording your own music and creating simple websites. It’s the kind of software that you sell PC users that barely know how to hold their mouse… Alright, I admit, that is an exaggeration, but if you are a bit more serious you would be looking at more fully featured software from a vendor such as Adobe. Apparently about 50% of their customers are aged 45+, exactly what I would have expected. The table above shows a breakdown of revenue by region, and I think this shows that their products aren’t very good. They get two-thirds of their business from countries with German as the official language, and while that seems logical for a German company you have to realize that good software can easily cross borders, and that is getting progressively easier with the rise of online marketplaces. In the long run you have to wonder what kind of future there is for Magix, and how they can compete with companies that can spread R&D costs over a bigger user base. Don’t think being big in Germany is going to cut it in the long run. Another problem with their business is that they mainly have products for the PC, and that is a market that seems to be in a long-term decline. They do have some apps for tablets and smartphones, but not a whole lot. In addition they have a number of products that are soon to be antique. The market for software to digitize LP’s can’t be getting bigger. For years, Sequoia has been an integral part of leading broadcast and mastering studios worldwide, including the BBC, German public broadcasters WDR, MDR, SWR, the Vienna Symphonic Library, and Sterling Sound in New York. For sound engineers, music producers, radio journalists, and so on, Sequoia is an indispensable tool for any type of professional media production. An interesting part of the Magix thesis is what insiders are doing. After the IPO in 2006 insiders owned 50% of the company, and that stake has slowly increased to 72.3% today. They increased the number of shares they own by a small amount, but the largest part of this increase is the result of Magix buying back stock. The company announced in July its intention to buy back another 10% of the outstanding shares, but in 20 weeks time they were able to acquire just 1% of the float on the open market. To speed up the process they launched a tender offer that was completed last month. The tender offer was at a minimal premium to the latest market price and they only managed to acquire another 449,537 shares (the tender offer was for 840,000 shares). The company used tender offers to buy back shares before in 2007, 2008 and 2009. What’s of course a good question to ask is how the endgame is going to look like. It seems to me that management is trying to buy back their company, although they are not in any hurry. At some point in time I would expect that they will try to take it private again, and that could mean a nice premium for the remaining shareholders. It’s not a problem if this is not going to happen: buying back undervalued shares is already a great use of capital. One thing that might be a concern in the long-term is what might happen if management is too successful in buying back shares. If their ownership stake reaches the 95% threshold it’s possible for them to squeeze-out the remaining minority shareholders. In a squeeze-out you have to go to court if you don’t agree with the amount of cash management is offering, so you will be in a vulnerable position. Details of the relevant German laws can be found here. Given the problems the company has to acquire a meaningful amount of shares at current prices I don’t think this is a big risk. I’m not very enthusiastic about the business Magix is in, but you can’t deny that it is still producing a decent amount of money. The company generates roughly €3 million/year in FCF, and that is after significant investments in new software development. R&D spending has averaged around €13 million/year (approx €10 million is expensed while €3 million is capitalized). They need to keep investing in new software to stay relevant, but I think it also shows that the company could remain cash flow positive even if things would really deteriorate. It’s something to keep an eye on though. How to value a software company with an – in my opinion – uncertain future is a good question. But to paraphrase Buffett (I think): “you don’t have to know a man’s exact weight to know he’s fat”. A business shouldn’t be valued at €11.5 million if it would be able to generate that amount in FCF in a single year if it would simply cut back on R&D spending. While I have been a bit negative in this write-up about the business they aren’t dead yet, and it’s totally possible they manage to keep their place in the market, or that they manage to reach new markets with the mufin product. I don’t think they deserve an EV/EBITDA ratio of 1.5x. If a 4x ratio would be more appropriate you are looking at a company with an intrinsic value of ~€47 million, implying an upside of 66%. I don’t think Magix is a high quality business, but it’s cheap. 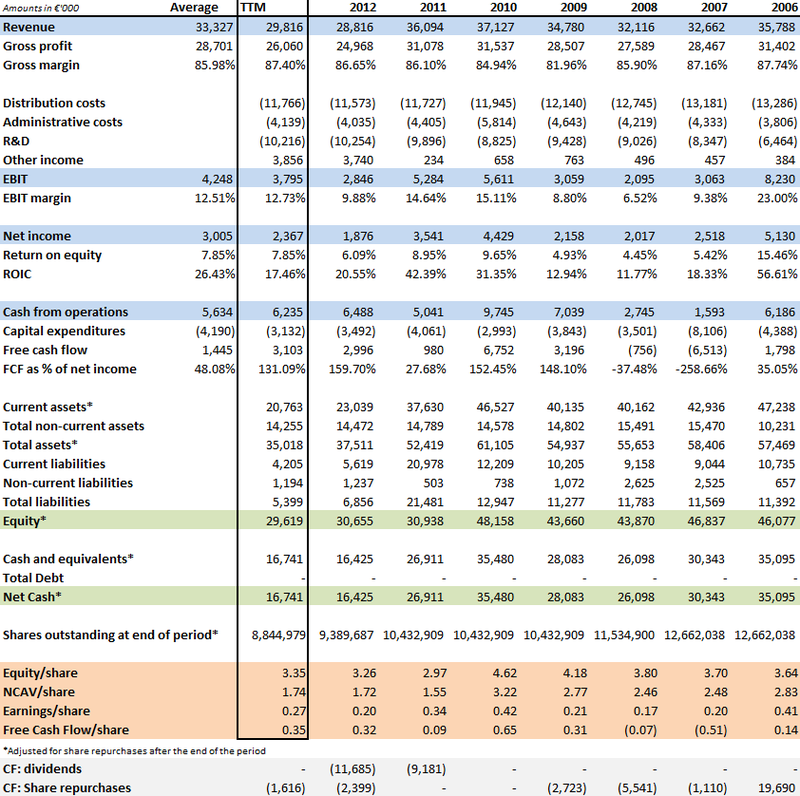 With a large cash balance the downside should be somewhat protected, and what’s even better is that management has a long track record of returning cash to shareholders through special dividends and share repurchases. Usually when you buy a cash rich business you have to worry that management squanders the cash on some stupid acquisition, but I don’t think you have to do that in this case. What also helps is that management has a big stake in the business. This entry was posted in Portfolio and tagged MGX.DE on February 7, 2014 by Alpha Vulture.